I know what you are thinking. Why the heck am I making a blueberry crisp in the fall? 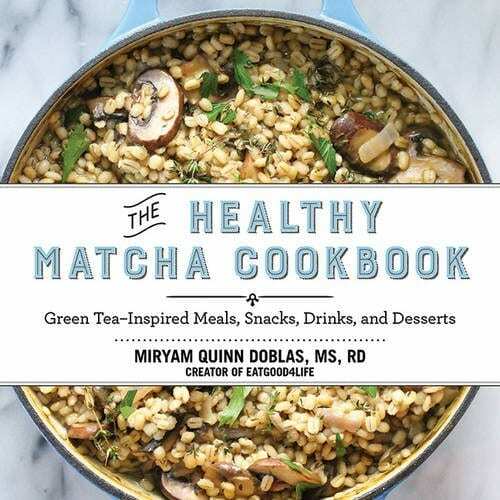 Well it’s because I am reviewing my friend Miryam’s new cookbook, The Healthy Matcha Cookbook – Green Tea Inspired Meals, Snacks, Drinks and Desserts. Miryam is the creator behind the blog, Eat Good For Life. If you have been wanting to try matcha, this book is for you! Have you heard about matcha? It’s a concentrated, powerful powdered form of green tea. Matcha has been named one of the most potent superfoods. Matcha is full of antioxidants, helps fight free radicals, boost metabolism, lower cholesterol and so much more! I have done a little cooking with it in the past, see my matcha truffles, but Miryam has come up with all kinds of creative ways to use it. 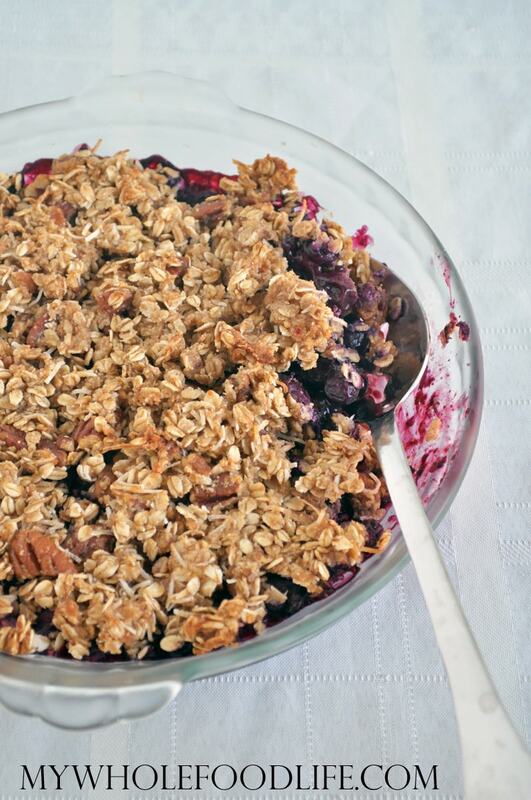 For example in this healthy blueberry crisp. I would have never thought to add matcha, but it really adds a nice flavor. This crisp is vegan and gluten free. I even made my version oil free by using applesauce in place of coconut oil. In the recipe, Miryam states that any fruit can be used, not just blueberries. I can’t wait to try more of the recipes. They all look so easy! Next on my list is the lemon coconut bites. Yum! I should state, that not all of the recipes are vegan, but many are. In a round 9-inch pie dish , add the blueberries and arrowroot. Mix thoroughly and then set aside. In a large mixing bowl , mix the rest of the ingredients until you obtain a cohesive mixture. Spread this mixture over the blueberries. Bake for 25-30 minutes, or until the top looks a golden brown. Turn off the oven and let the crisp cool inside the oven for 30 minutes. Click here to find out more info, or to purchase The Healthy Matcha Cookbook. You said any fruit could be used, but what about apples or pears since they are firmer? I bet you could use them too. Maybe slice them thin? I have a little tin of neglected matcha sitting in my cupboard. I love matcha lattes, but don't love how much sugar I need to add to make it palatable for my tastes (and I love bitter drinks like tea and coffee). Sneaking it in baking seems like a good idea! Made this and it was delicious!!! What is the nutrition info on these? I used 1 tablespoon of ghee in place of coconut oil and it worked perfectly! Thanks for sharing! Approximately what would 10 oz of blueberries be in cups? I don't have a food scale! And could I sub anything for arrowroot powder? That's not something I have either. If I had to guess, I would say 3 cups? You can use cornstarch in place of arrowroot. Had no idea what exactly matcha is. Now I got it. 10/10 would try this healthy yum-yum. A cookbook entirely about matcha? I'm gonna have to look into this!